NEW YORK (August 28, 2017) – FlightSafety International announces that SF Airlines of China has purchased a full flight simulator for the Boeing 757-200F aircraft. 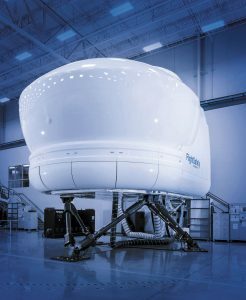 The new FlightSafety FS1000 simulator is scheduled to be installed at the SF Airlines training facility in Shenzhen, China late next year. “As one of the top cargo airlines, SF Airlines operates the largest freighter fleet in China and always attaches great importance to pilot training. FlightSafety is a time-honored simulator manufacturer. We believe its product will have high level reliability and fidelity, thus shall be of great help to the pilot training of SF Airlines,” said Miao Ligang, Director of Business Development Department of SF Airlines. FlightSafety FS1000 simulators feature tightly integrated computer hardware and software across subsystems which allow for more accurate and higher fidelity simulation. They offer a new multi-function instructor operating station designed to enhance the effectiveness of training by providing an intuitive interface, scalable graphics, and large multi touch displays. The simulators are equipped with FlightSafety’s VITAL 1100 visual system and electric motion control and cueing. FlightSafety has delivered more than 140 simulators for commercial aircraft to date. They include a variety of devices for aircraft manufactured by Airbus, Boeing, Bombardier and Embraer and are utilized by airlines in Asia, Europe, the Middle East and North and South America. SF Airlines Co., Ltd. is an air cargo company and member of the S.F. Express Group based at Bao’an International Airport in Shenzhen, Guangdong province. The airline provides services throughout Asia using its fleet of over 40 Boeing aircraft.